I made a delicious BBQ Wagon Wheel Stew tonight – to go with it, what could be more perfect that crusty golden buttermilk cornbread topped with honey butter? Melt butter in large skillet. Remove from heat and stir in sugar. Quickly add eggs and beat until well blended. Stir buttermilk into mixture in pan. Stir in cornmeal, flour, baking soda and salt until well blended and few lumps remain. Pour batter into the prepared pan. Bake in the preheated oven for 30 to 40 minutes, or until a toothpick inserted in the center comes out clean. 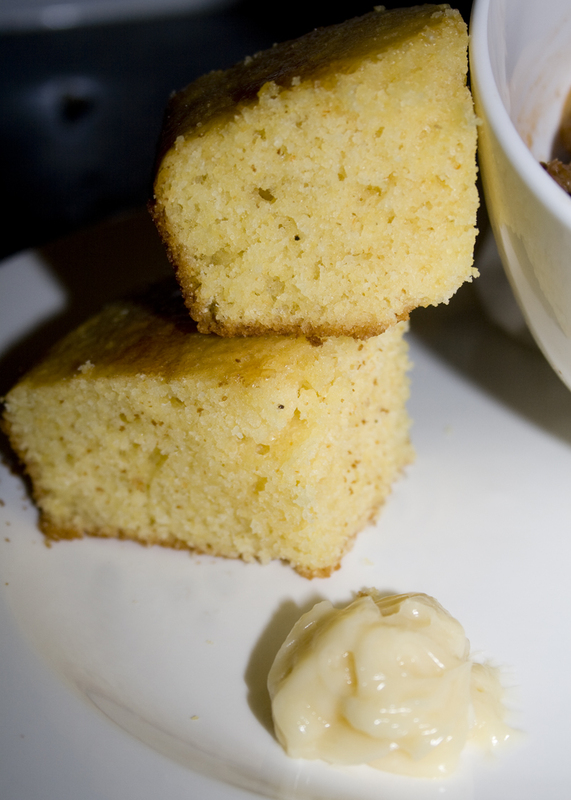 After removing from oven, spread a thin layer of honey butter over surface of cornbread while still in the pan. Serve warm with honey butter. *If you don’t have any buttermilk, substitute “sour milk” – mix 1 C milk with 1 1/2 T fresh lemon juice. Allow to stand while you prepare other ingredients. Milk will thicken to the consistency of buttermilk or a runny yogurt. 1. In a small bowl mix butter and honey until smooth.